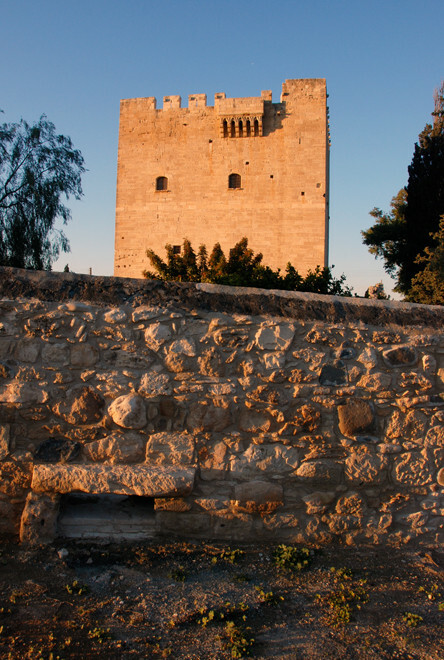 The 15th century keep of the castle on the Knights Hospitaller at Kolossi in evening light, January 2013. 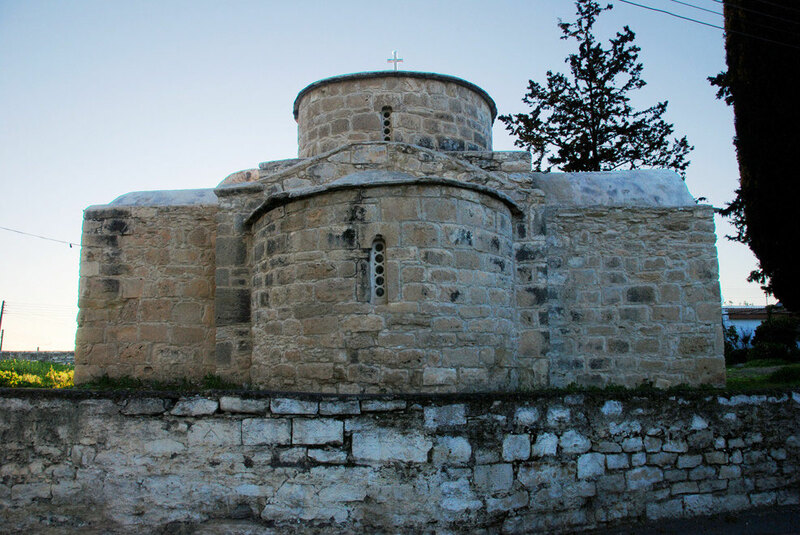 I had consciously or not avoided the 'Crusader Castle' at Kolossi. It seemed to be all of a piece in my mind with a particular kind of British Cyprus tourist experience that combined modern Limassol, the base at Akrotiri and old religious orders toughing it out with resurgent Islam back in the time of the Crusades. But after my marathon drive through the Pitsilia Hills and Krasochoria wine-villages one brisk, sunny early-January day I happened to pass the old keep on my frazzled way to take a quick look at the salt lake at Akrotiri (see my page Salt Lakes). As I passed back the sun was just about to set in the south-west and was casting the limestone tower in an alluring golden light. I had to stop, fagged out as I was. By now the little heat of the day had disappeared and the air was crisp and cold. The castle itself was preparing to close. A few Japanese tourists were leaving. I walked quickly around the external walls of the enclosure taking photos of the sun on the stone, of the huge Peruvian Pepper tree (of which more below), the so-called 'sugar factory' and the 12th century church of Agios Efstathios, and for contrast a modern half-finished house across the road from the castle. Golden light on the 15th century keep of the castle on the Knights Hospitaller at Kolossi, January 2013. 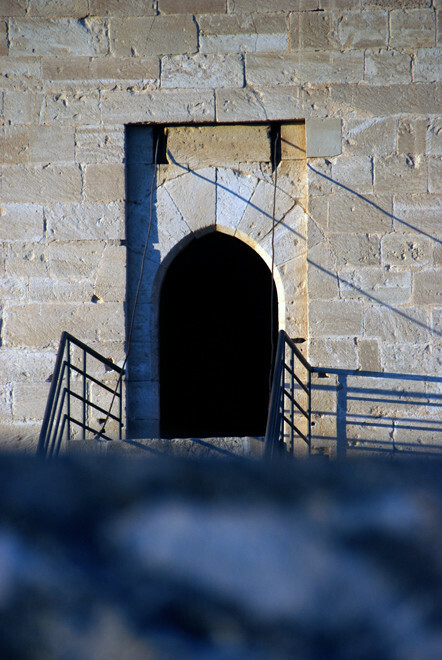 The extant limestone keep is an attractive, minimalist building with elegant detailing on the battlements. It was built in 1210 when the vast lands around it were granted to the Knights Hospitaller by the Lusignan, King Hugh III. After the loss of the Holy Land to resurgent Islam in 1291 (see below) the castle became the Knights' temporary headquarters before they invaded Malta and made it their permanent base in 1309. The castle itself was virtually destroyed by Mameluke raids in the 15th century and rebuilt by the Knights in 1454. The Venetians took it over in 1488 and its gradually deteriorated under the Ottoman's until a British restoration in 1993. 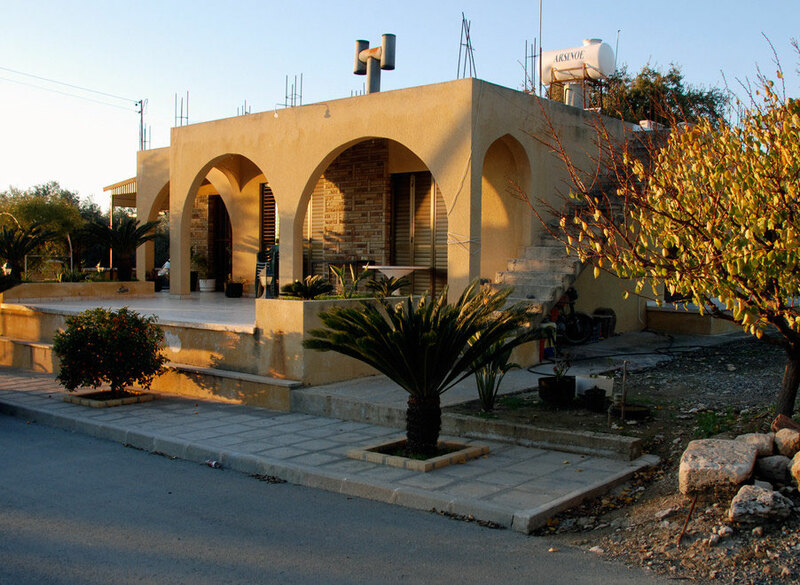 (The castle stands within the confines of the British Sovereign Base Area of Akrotiri). 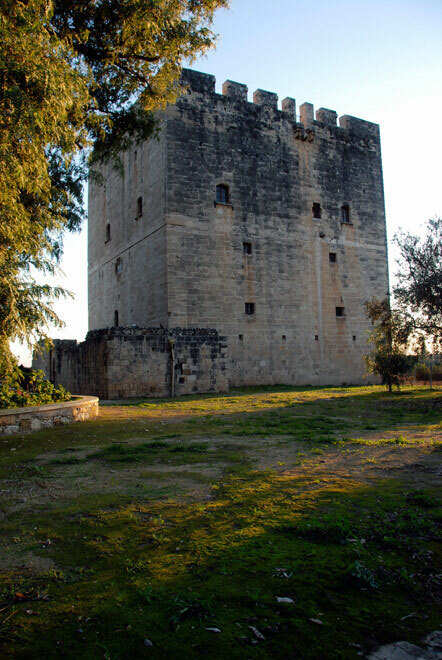 (See Rough Guide pp.137-8 and Wikipedia: Kolossi Castle). Although ignorant of the fact at the time, the castle and the Knights Hospitaller (also known as the 'Knights of St. John") are closely linked to the development of the medieval Commandaria wine trade (see my Wine-villages page) and the fabulously profitable medieval Cyprus sugar industry (see my 'Sweet Salt' page). The order also had important bases in England and in particular at the Clerkenwell Priory in London (see below). 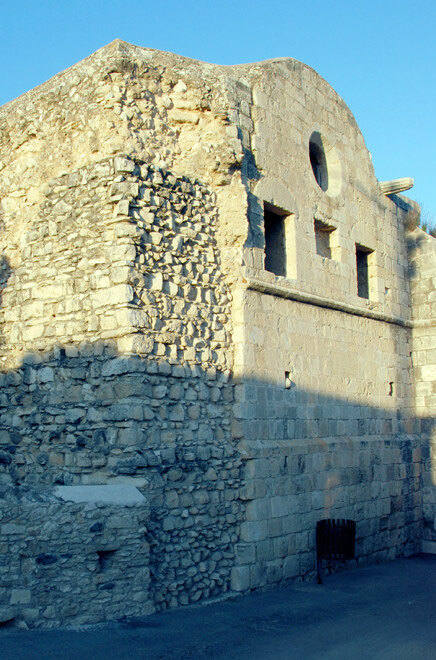 Raised dorrway of the 15th century keep of the castle on the Knights Hospitaller at Kolossi in evening light, January 2013. Variously called the 'Knights of St John' or the 'Knights Hospitaller' the order was the major Christian military force in the Holy Lands at the times of the pilgrimages and Crusades to Jerusalem (600 AD-1291). At the height of the Kingdom of Jerusalem, the Hospitallers held seven great forts and 140 other estates in the area. The property of the Order was divided into 'priories', subdivided into 'bailiwicks' (run by a 'Bailli'), which in turn were divided into 'commandries'. 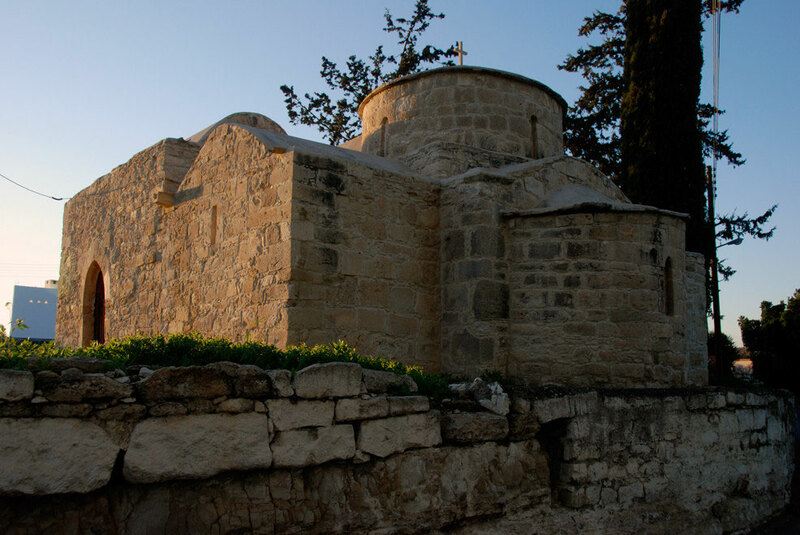 After the fall of the Kingdom of Jerusalem and Acre in 1291 the knights sought refuge in Cyprus before eventually establishing themselves by conquest in Rhodes in 1309. 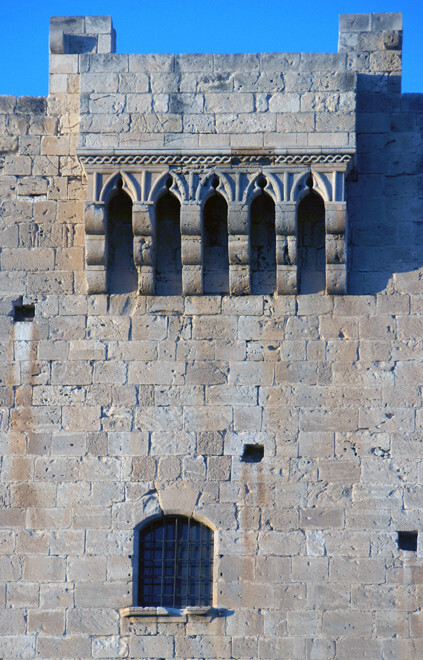 Detail of the The 15th century keep of the castle on the Knights Hospitaller at Kolossi in evening light, January 2013. Eventually forced out of Malta by Napoleon in 1798 the much-reduced order re-established itself as the Sovereign Military Order of Malta (SMOM) and continues to this day. South end of the water-powered 'sugar factory' at Kolossi, January, 2013. For more on Cyprus' medieval sugar industry see 'Sweet Salt'. The English end of the vastly powerful order had its base in the extensive grounds and buildings of the the medieval Grand Priory of the Knights Hospitaller at Clerkenwell Priory in London. The Priory was established in 1185 and among other things acted as a forward staging post for English contingents to the Crusades. It was burnt down in the Peasants Revolt and rebuilt in 1504. Henry VIII dissolved the Priory and most of the order decamped to Malta, save for three knights who did not and were executed for their refusal. The Priory lands and buildings were granted to various noblemen for storage and feasting purposes. The church was blown up in Edward VII's reign for building stone and then variously rebuilt. The order was re-established and then sent packing to Rhodes again by Elizabeth I. The church then became a private chapel and later a Presbyterian chapel before being incorporated into the Church of St John Clerkenwell in 1723. All that remains of the once vast Priory complex in today's hip, trendy and very expensive Clerkenwell is the largely reconstructed St John's Gate. (It was home to the young William Hogarth - see Jenny Uglow's fabulous biography). (For above see Wikipedia: Clerkenwell Priory). There was also a commandrie called 'St John's Jerusalem' in Kent at Sutton-at-Hone, which now a National Trust property that includes the 13th century chapel of the Knights Hospitaller and a garden moated by the River Darent. Where the Knights Hospitaller prayed: 12th century church of Agios Efstathios next to Kolossi, January 2013. In 1831 a British order related to the SMOM was founded and became known as the ' Most Venerable Order of St John of Jerusalem in Great Britain'. Its best-known activities centred upon the (non-faith based) St. John Ambulance brigade and the St. John Eye Hospital in Jerusalem. There is an interesting Museum of the Order of St John and information centre behind St John's Gate in St John's Lane (see here). The huge tree that has grown by the castle is wonderful. I thought it was an acacia but later learnt that it is a Peruvian Pepper Tree (Schinus molle) and sometimes in Cyprus called 'Artimathkia'. The word 'molle' comes from the Quechua word for the tree, 'molli'. The Kolossi tree is a magnificent specimen and caught the golden sinking January sunlight like smoke in its foliage and sweeping branches. The Peruvian Pepper Tree is a quick growing, drought tolerant, hardy evergreen and has dense clusters of pink or purplish berries that can be present year-round. The characteristic grey bark is rough and shaggy and exudes sap. The bark, leaves and berries are aromatic when crushed and are supposed to keep mosquitoes at bay. Peruvian pepper tree (Schinus molle) - Artimathkia - catching the last of the sun at Kolossi, January, 2013. S. molle is native to the arid zone of Northern South America and Peru's Andean deserts. It has become widely naturalised and a serious invasive weed particularly in South Africa and Australia. Although not related to commercial pepper (Piper nigrum) the pink/red berries are sold as pink peppercorns and often blended with commercial pepper. In traditional medicine, S. molle was used in treating a variety of wounds and infections due to its antibacterial properties. The Inca used the sweet outer part of ripe fruit to make a drink and syrup that was mixed with a maize gruel. It was also used to make 'chicha', a fermented alcoholic drink in the Central Andes. (See Wikipedia: Peruvian Pepper and Cyprus High Gardens). 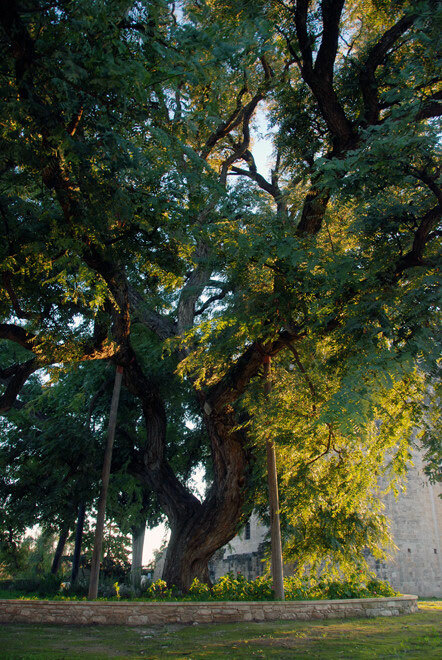 I wonder if the tree is the remnant of a one-time herb garden in the grounds of the much-bigger original castle and was related to the Knight Hospitaller's activities to provide care for poor, sick or injured pilgrims to the Holy Land.